This classic perfume diffuser features charming lily of the valley—a beautiful little woodland flower with an intoxicating fragrance, well-known and loved by all. Bring the scent of sweet fresh flowers to every room in your home and enjoy the sophisticated ambience that this luxury diffuser creates. Modern life can be hectic and demanding—and all of us can feel a little run-down from time to time. For friends or family who need a mental boost, this wonderful fragrance is well-known for its power to relieve depression, imbue happiness, encourage a sweet disposition, and evoke a sense of security. Gift this stunning fragrance to someone in need of a pick-me-up or treat yourself to some well-deserved pamper time using the stunning scent as a mood-lifting backdrop. Relax and indulge as the secretive fragrance takes you on a journey of reminiscence through flower-filled summer meadows, gently swaying in the warm afternoon breeze. This enchanting floral blend beautifully perfumes every corner of the home naturally, without the use of potentially harmful chemicals and toxins that are so often found in air fresheners and room fragrancers. The luxury 100ml diffuser with natural rattan sticks gently disperses the perfume around your room for a long-lasting, wonderful aroma and continual benefits. 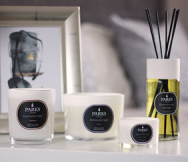 Stylishly packaged in an attractive gift container with our iconic Parks branding, this diffuser is an ideal gift for birthdays, anniversaries, or any time of the year when you want to show a loved one that you care.